Tunis may be my one true love, but I found plenty of other interesting sheep in Ringwood. Two that particularly stood out to me were Polypay and Santa Cruz. Polypay is a lovely sheep with a funny name. I hadn't heard of these guys before taking the class, but I was very pleased to find out about them. The breed was developed as an all-purpose sheep that excels at multiple births - thus increasing a farmer's profits (Poly - many, pay - money: get it?). 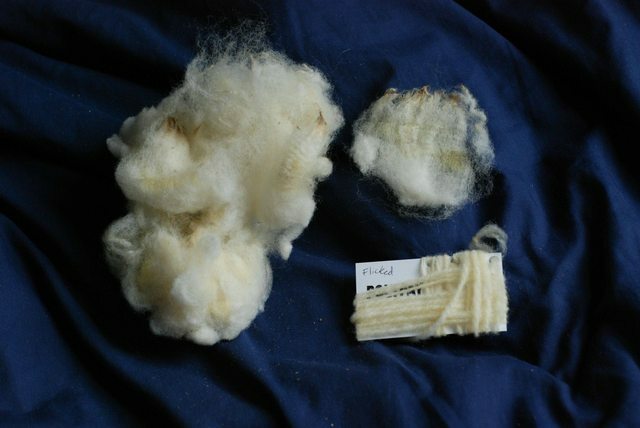 Polypay are a mix of Finn, Dorset, Targhee and Rambouillet. 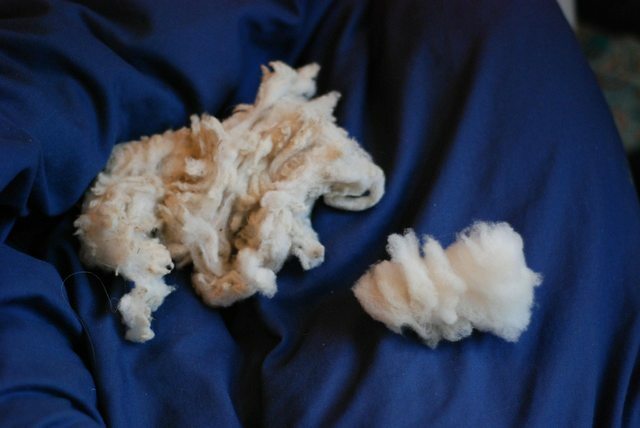 The fleece has a crisp feeling, with not much of the softness you would expect from the Targhee & Rambouillet ancestry, but it's not scratchy either, just a bit 'crunchy'. 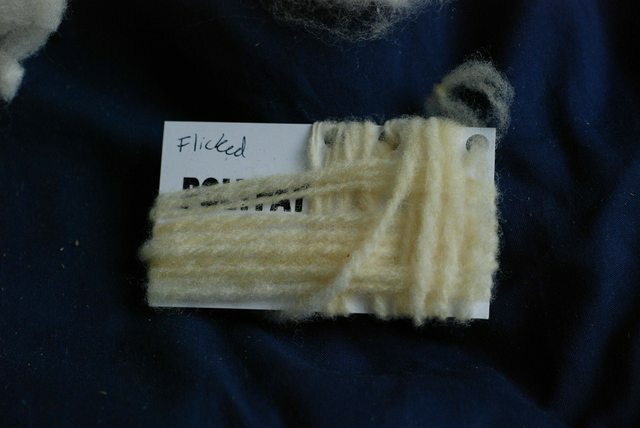 It spins into a great lofty yarn - this sample is spun woollen from flicked locks. I would love to make a nice cushy (but still sturdy) sweater from this stuff. I'm not sure if I'll be able to get ahold of more Polypay in the future, but I will be looking into their ancestor the Dorset. I'd heard good things about Santa Cruz before the class, so I was eager to spin it. Deb Robson loves the stuff. 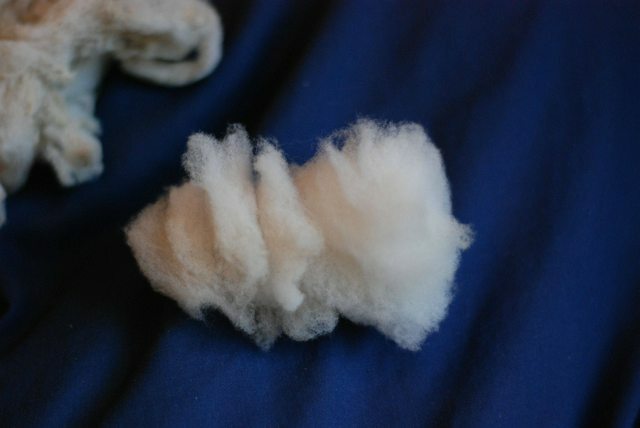 The wad of fleece that faced me was short, soft, and spongy. I tried combing it, but the day of the workshop was the very first day I'd combed anything, ever -- so I wasn't very good at it and I produced a less-than-satisfactory yarn. I didn't really enjoy it, neither the spinning nor the finished product. Arriving home, I took another crack at the Santa Cruz. I dove into my little ball of fleece and pulled out each well-defined lock I could find. Then, painstakingly and very carefully, I flicked open each one. Then, I spun from the lock. This was quite slow and I still didn't get a perfectly even yarn, but I was much happier this time around. 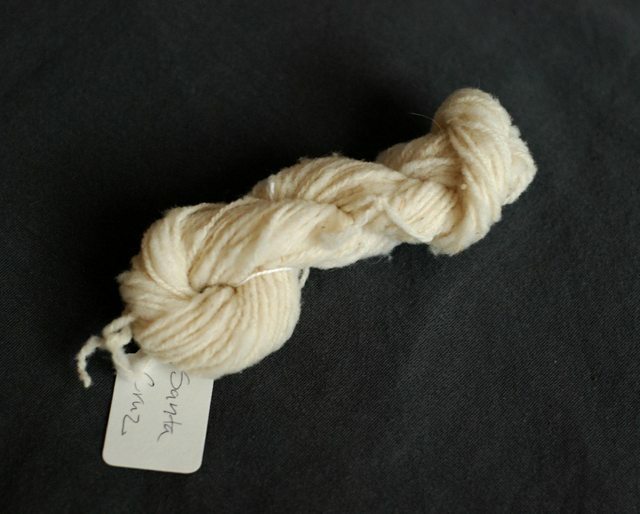 I produced a small skein of very springy, spongy yarn. I would be very happy to have more of this yarn, were it not for the pain in prepping it! But, the breed is so rare, I may not get an opportunity to work with it again - I am very glad I had the chance. The world is full of such wonderful diversity of fibre - while I love working with British breeds, it was really nice to get a taste of something else as well. If you have the chance to try out either of these breeds, I recommend it!